Come celebrate this historic Mustang event with us! The Mustang Owner's Museum’s Ground Breaking Ceremony will be the first Mustang Powered Special Event that will take place at this wonderful location. And believe us, it is a wonderful location! As a true Mustang enthusiast and member of the Mustang Nation, these two days will mean so much to you as time goes by. Not because your Mustang earned or won an award this day, but because you’ll be able to say you were here with us at the very beginning of the Mustang Owner's Museum! All of us have our own special Mustang Memories and what can be more memorable than being in Concord, North Carolina when the first shovel of dirt has been tossed in the building of the Mustang Owner's Museum? It’s a true Mustang enthusiast’s dream! So again we say to you, come and celebrate this historic Mustang event with us! Here’s a preview of what you’ll see. The Mustang Owner's Museum’s Ground Breaking Ceremony will consist of 3 separate special Mustang events. The Friday Afternoon Mustang Display. Will be held at the Cabarrus Arena, located at 4751 NC Highway 49 Concord, NC 28025. Parking begins at 12:00 noon and ends at 6:00pm. Bring your Mustang(s) and help us celebrate! This will be a historic gathering of Mustangs and the people who are involved and will be involved in the building of the Mustang Owner's Museum. Don’t miss this once in a lifetime opportunity! The Friday Night Banquet on July 29th. Will begin at 6:00 pm with a no host/cash bar, with dinner beginning at 7:00 pm. The guest speakers will begin at approximately 8:15-8:30 pm, with the Banquet closing around 9:30 pm. Come and hear our vision of the Mustang Owner's Museum. The Ground Breaking Ceremony on Saturday, July 30th. Parking will begin at 9:00 am with the ceremony beginning at 2:00 pm. The event will end at approximately 3:00 pm. The location is the actual Mustang Owner's Museum site which is located at 60 Pitts School Road, Concord North Carolina. After everyone has had a chance to enjoy the site, take pictures of their Mustang at the place where the Mustang Owner's Museum will be built and open next year, make new friends for life with the other Mustang enthusiasts who are in attendance, and, maybe the most special of all, have the time to bond with the historic moment, we will go our separate ways, all of us knowing that we will always have a very special Mustang day to remember. And when it comes time to celebrate the Mustang Owner's Museum’s Grand Opening, guess who is going to get that very special personal innovation to attend? That’s right. Everyone who attended this very special Ground Breaking Ceremony! We hope that will be you and we look forward to seeing you at both events! Giuliano Zuccato is one of our special guest surprise speakers at the​ Friday Night Banquet. 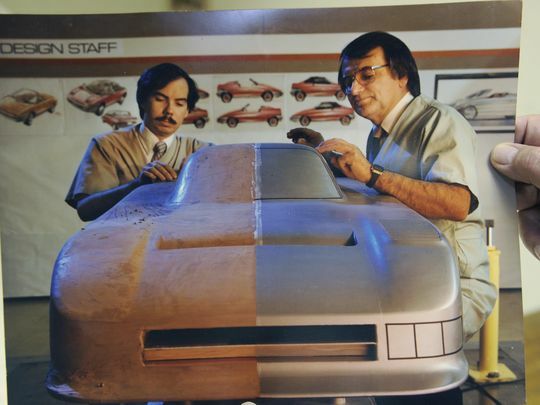 Giuliano was part of the team that developed the first Mustang, first as a drawing and then sculpted clay. The Mustang Owner's Museum presents its first event, the Ground Breaking Ceremony on July 29th & 30th 2016 at Concord, NC. This is the Mustang enthusiast opportunity to help break ground on the actual Museum site. The Ground Breaking Ceremony will begin on Friday July 29th at the Cabarrus Arena with the Ground Breaking Ceremony Banquet limited to 400 guests. There will be a no host bar from 6PM to 7PM, with dinner beginning at 7PM. Guest speakers to be announced. Parking for The Ground Breaking Ceremony will begin at 9AM on Saturday the 30th at the grounds of the Mustang Owner's Museum, with the ceremony starting at 2PM. ﻿REGISTRATION INFORMATION - PICK THE REGISTRATION OPTION THAT’S BEST FOR YOU! Per Person Registration is for our guest(s) who are attending but can’t bring their Mustang and do not want to attend the Ground Breaking CeremonyFriday Night Banquet. Per Person Registration includes admission for both the Friday Mustang Display and Saturday’s Ground Breaking Ceremony, only. One Wrist Band will be issued in your packet at the event. This registration is for enthusiasts who want to attend the Ground Breaking Ceremony but can’t attend the Friday Night Banquet. This registration includes parking and one guest admission for the Friday Mustang Display. This registration also includes parking and one guest admission for the Ground Breaking Ceremony at the Mustang Owner's Museum location, subject to space availability**. This registration also includes a Ground Breaking Ceremony dash plaque. One Wrist Band will be issued in your packet at the event. The Friday Night Banquet Registration includes entry for one Mustang and one guest admission for all of the events; the Friday Mustang Display, the Friday Night Banquet and the Saturday Ground Breaking Ceremony. This registration also includes a Ground Breaking Ceremony event dash plaque. This registration also includes parking and one guest admission for the Saturday July 30th Ground Breaking Ceremony at the Mustang Owner's Museum location, subject to space availability**. One Wrist Band will be issued in your packet at the event, along with a Banquet Ticket per registered guest.Friday Night Banquet Youth Tickets (15 and under) available for $50.00. The exclusive Mustang Owner's Museum GBC Official Merchandise will be made to order for this event and sold only through orders placed at the time of registration or through a limited amount of overages at the show. This GBC merchandise will not be re-produced after the event and only offered for sale on the website if there are any left-over items after the event, in whatever sizes are left. To be assured that you receive the size(s) you want, it is strongly recommended that you order GBC merchandise at the same time as submitting your GBC Registration. Orders will be placed for the GBC merchandise on Monday, July 11th, 2016. Ordered GBC merchandise can be picked up at the host hotel when you pick up your registration packet or shipped to you after the event. Sorry, but this event has a very short lead time and to insure that we have all of the GBC merchandise ready when you arrive, we will need to hold to a tight schedule. If you wish to pick up your merchandise at the event, please enter the coupon code PICKUP at check out, otherwise your order will be shipped to you. Official event t-shirt for the Ground Breaking Ceremony. Be sure to order before July 10th, 2016 to insure availability. All registration packets and GBC merchandise will be picked up at the host hotel, the Hampton Inn, 9850 Weddington Rd. Concord, NC 28027. The hotel is located off of Bruton Smith Blvd., exit 49 east of I-85 from 3:00 pm to 6:00 pm on Thursday July 28th and from 9:00 am until 4:00 pm Friday, July 29th, 2016. After that time, Registration will be moved to the event site and resume at the Cabarrus County Arena 4751 NC Highway 49 Concord, NC 28025 from 1:00pm to 7:00 pm. No registration packets will be mailed out. We ask that you bring your payment receipt with you when picking up your packet to avoid any confusion. *The Friday Night Banquet is limited to 400 guests. The Friday Night Banquet event passes include all activities of the Ground Breaking Ceremony on both Friday the 29th and Saturday the 30th except for the purchase of event merchandise. **Parking at the GBC location is limited. A second parking location near the GBC location will be available when the GBC location parking is exceeded. ​All proceeds from the Mustang Owner's Museum Ground Breaking Ceremony ​will go to benefit the Mustang Owner's Museum.